I LOVE bangle bracelets. They've always been my favorite. 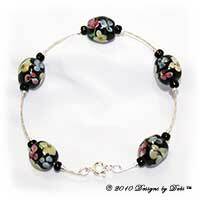 And back around the end of 2005 I was looking for beaded bangles. Well, I couldn't find what I was looking for so I did a little research and decided, since I was on a leave of absence and had the time, that I would try to make them myself. This didn't exactly surprise anyone. I've been very blessed with a knack for figuring out how things are done or made...a real do-it-yourself-er...thanks to my Dad. He's the same way and he taught me well :) Thanks Dad!! It took some trial and error to come up with a design... a couple months of researching, fiddling, testing, more research, more fiddling and more testing. I bought an array of tools and materials and tried all sorts of things. Finally, I came up with a design that worked! 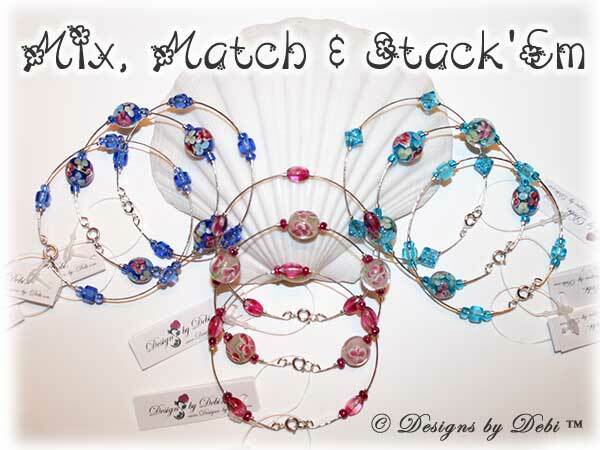 So I bought the materials I needed and started making my beaded bangles in early 2006. Designs by Debi Bangle Bracelets fit just like true bangle-style bracelets, with that same wonderful fluid motion as they rotate around your wrist. The only difference is that they have a clasp. They're currently available in silver-plated and gold-plated styles. They're stylish and fun, the perfect addition to all your summer fashions. They're great for stacking which is important because, as those of us who wear bangles know...you can never wear just one! And the best part is they come in more colors and themes than you could ever imagine...silver, gold, flowers, hearts, cubes, swirls of color... And, of course, there are my Signature Collection Bangles and Tennis Bracelets that are made with Swarovski® Crystals. Many designers string curved noodle beads on regular flexible beading wire and call it a bangle when in fact it's not...it's just a regular bracelet with noodle beads. It doesn't hold it's shape...it fits just like a regular bracelet. And if it doesn't hold that round shape, it's not really a bangle, right? 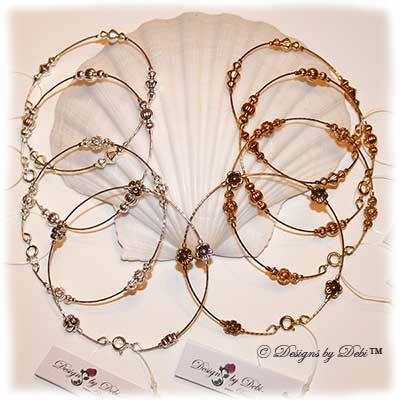 At Designs by Debi, bangle bracelets are true bangle bracelets. They have a clasp (so they fit a wider range of sizes), but they keep they're shape...unless you crush them...and they have that same fluid motion bangle wearers like myself love so much. I'm very excited to finally be getting these up on the website for you. 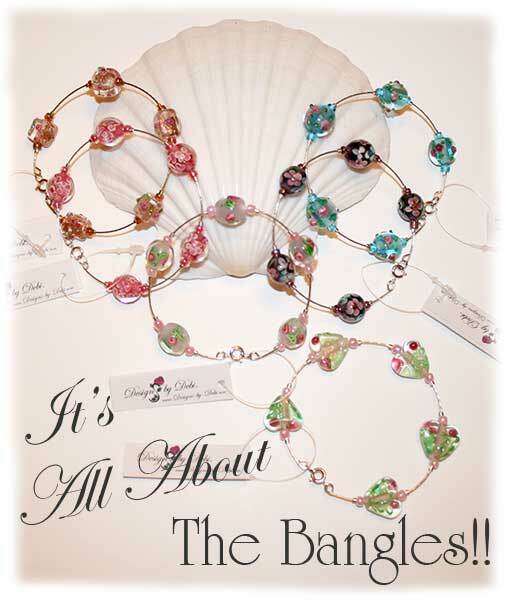 If you like bangle bracelets, you're going to LOVE these!! I also make Fitted Bangle Bracelets and that's how I refer to that style. They're also made on stiff formed wire to keep their shape, BUT they are made with noodle beads, fitted and DON'T rotate around the wrist. It's a great style for those of you who like a tighter fitting bracelet that won't move around. You can find them here. 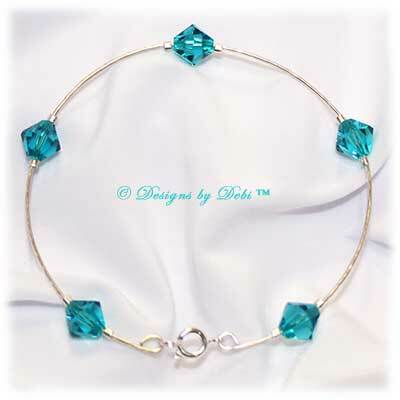 You can find the Designs by Debi Bangle Bracelets here. The Designs by Debi Signature Collection Bangles are here. 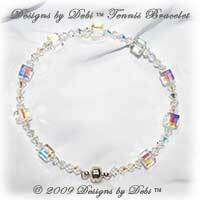 And, if you're interested, the Designs by Debi Tennis Bracelets are Bangles, too...with unrivaled sparkle! You can find those here.